Angie Woods has an amazing approach to canine behavior based on natural, holistic and, most importantly, instinctual way of thinking. She is educating people about the difference between Human Psychology and Dog Psychology. 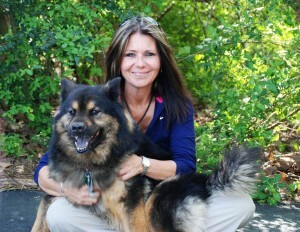 Angie does not consider herself a dog trainer but rather a canine problem solver. Her fresh approach has been hailed as revolutionary: first you must center the human before you begin teaching them about the dog. When Angie was a young mom she operated a grooming business from her home. Many other groomers would send her the dogs whose temperament or rambunctiousness they could not handle. As her children began to get older she started volunteering at a local veterinary clinic as a veterinary technician and then spent the next 17 years in veterinary medicine. After her time at the vet clinic she spent the last 6 years of her medical experience involved in wildlife rehabilitation. Whilst working at the veterinary clinic she became known for helping with unstable dogs and this then grew into clients of the clinic turning to her for help with their dog’s behavior problems. As the years passed Angie really focused on learning everything she could about canine behavior. She attended university behavior seminars, read books, and completed educational courses but most importantly she began living with a pack of dogs. Angie made it a point to study and be an super observer of dogs. What does Angie mean by “Natural Holistic Approach?” Think about the animal being given the opportunity to be in a natural environment and amongst their own species. In other words, what is the natural behavior of the animal? This may be completely out of your realm of knowledge but Angie really breaks the information down and helps people understand why they have trouble with our dogs and what we can do about it. People want real solutions that work and Angie’s lessons are life lessons, not just dog lessons.